I’ve been blogging now for nearly three years. At the end of this month will be my 3-year Bloggiversary. Three years doesn’t really sound that long but it is SO weird to think back to those first few months of blogging. My blog has grown a lot in those three years. It’s by no means a HUGE blog but (thanks mostly to Pinterest) my traffic has gotten much better with each year. I want to share my Blog Story with you. I know that it seems like most of the time Blog Storys are shared when a blogger has “Made It” and is now making the big bucks with their blog. Is that how a blogger defines success? I really don’t know. I personally define success when I’m proud of everything I post, when my projects are inspired and amazing and consistent. When I rule my blog, not when my blog rules me. And when my numbers are steadily increasing rather than declining, although that can be arbitrary based on the yearly fluctuations (pageviews always go down after the holidays and during the summer.) But whether or not I’ve Made It, I think my blog story is kind of unique and I want to share it with you. I’m going to divide it into two or three parts because I want to tell you ever juicy detail and I’m that self-absorbed to assume you want to read it all. So here is my Blog Story. Once upon a time, there was a lonely stay-at-home-mom who had just opened a sad little Etsy shop called Honeybear Lane. She had sold things like hair bows and clips, appliqued onesies, skirts, and a few puff quilts. She had no idea what she was doing, so she spent a lot of time in the Etsy forums trying to figure out the best way to succeed. Okay, enough of third person. Anyway, I decided to start a blog as a way to advertise my stuff in a better way than the tiny little pictures allowed on Etsy. Plus I could direct people to my blog which could link to my shop. And I liked that a blog was a way to communicate with potential customers and make a connection. So I started posting random things that caught my eye and showed my recent wares. Since I was pregnant with my second baby, I was really into making baby stuff, which is what I was selling. I didn’t even know that the Craft Blog World even existed. I had only read the personal blogs of my friends and family and the idea of blogging to anyone else seemed extremely strange. I don’t even remember how I started discovering it, but I think it had something to do with my cousin Amy (of Amy’s Craft Bucket) who would send me links to blogs like Make it and Love it. I found Ashley’s amazing blog and was gone. I started reading more and more blogs and adding them into my Google Reader, spending way too much time reading blogs. Then I made the grand decision that I was going to pre-design puff quilts and sell them. So the Diamonds Quilt was the very first quilt I ever designed completely on my own. I decided that a good way to get the word out about my business was by having a giveaway (which was still new and totally exciting back then.) I contacted Ashley from Make it and Love it and got on her waiting list for a giveaway which I paid $50 for. That seemed so expensive to me back then! The giveaway was set for early August. Meanwhile, I decided to post a tutorial for How to Make a Puff Quilt, in four parts. 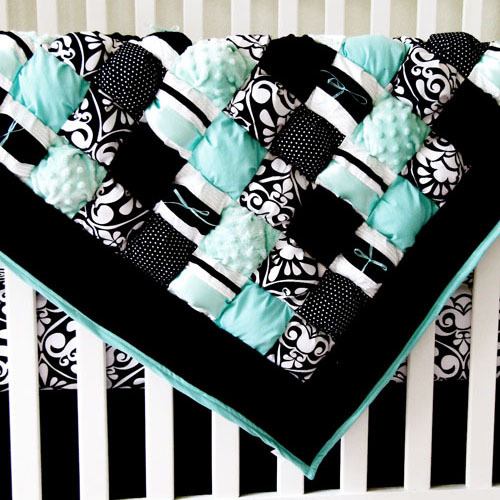 I had connected with Kari from UCreate through Twitter and mentioned to her via twitter that I was going to have a Puff Quilt Tutorial on my blog. She checked it out and said she would feature me. I was so excited although I didn’t even really know what that would mean for my blog. I literally had like 30 followers. On the day that Kari featured me, she didn’t just feature me, she did a whole blog post about me! She talked about the puff quilt tutorial of course. And that day…was. AMAZING. It was my very first Blog Payday (figuratively.) That morning I woke up, went to church, came home and got on the computer. My jaw dropped when I saw that I had over 200 followers now! Just in a few hours! But the best part were all the comments and emails I received. So many people wrote to say how they had seen a puff quilt back in the day or their Grandma made one for them. They wanted to make one but didn’t want to sew all those puffs together by hand (how they have traditionally been done) and how excited they were to try out this new machine method. I loved that I was able to bring up the nostalgia of puff quilts and incorporate them in a modern way. 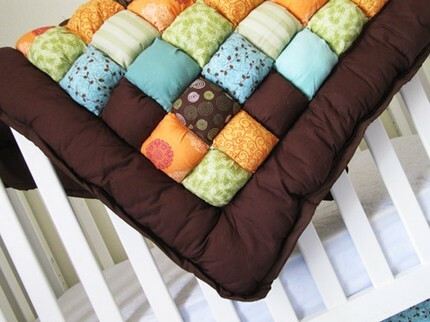 Puff quilts are like the perfect mixture of old and new–an old method that is made new with all the beautiful and fun fabrics available today. Puff quilts are each like little works of art and I love them more than I did back then. My very first puff quilt–check out those awful borders! That first feature lit a fire under me. I realized how much I LOVED the praise of random strangers (I know, weird) and how much it invigorated me to do more, to do better, to try harder. It was all the validation that I’d always craved from my creative works which had mostly been unappreciated until then. Well, that’s not really true but there’s really no comparison to the high you can get from comments. And especially to know that I was helping other women to discover their own creativity which is ultimately my biggest goal with my blog. A few weeks later, I had the giveaway on Make it and Love it. Ashley’s blog was the biggest craft blog (that I knew of) at the time, and it’s still HUGE! So I couldn’t have picked a better blog for my debut. That quilt was VERY well received! I think there was something like 1500 comments on that giveaway and I poured over them—eating it all up. Everyone was so excited about the quilt, loved my shop and all my items. It was like the best day of my life, seriously. Ashley even emailed me and said I should save it for a bad day to read these comments because they love you! So the next few days I reveled in all the glory and attention and was so excited that I’d gained like 700 new followers in a couple of days. It’s weird that Facebook wasn’t even a thing back then–it was ALL about Google Friend Connect followers. But nobody told me that there was no way I would be able to maintain the kind of traffic I’d just gotten. I was DESPERATE to keep it though. I felt like I had to hurry and get some other amazing projects and things to keep my new readers engaged. And out came the next few months of uninspired crap. Okay, not everything I did was crap but seriously, most of it was. And it was because I was letting my blog rule ME. I spent too much money on craft supplies so I could make these new tutorials and was stressing myself out because I didn’t have many ideas. It’s hard for me to be inspired under pressure–I do very poorly. I could never go on a Craft Wars-type show because I just don’t work well under pressure. And speaking of pressure, that doesn’t even touch on all the new shop orders that were streaming in. And then as if THAT wasn’t enough, I decided to enter the brand-new competition Crafting with the Stars and I made it. And I started realizing I might have to choose between the shop and the blog. And the stuff hit the fan. Tune in next time for Part 2! I’m already loving this little mini-series of yours – – keep the story coming! Thanks for your reflections and for sharing your creative wisdom with the world. I would love to keep a blog, but like you, cannot be tied to a blog, but rather prefer to add when time allows and when I feel proud of a completed project, rather than rushing. Fine work is always completed with love and patience. I applaud your work, honesty and enjoy reading your blog. Your work is created from love and please know that it is admired and honored as a reader. One day I will be brave enough to have a blog, it is talented people such as yourself that inspires mere mortals such as myself to one day create a blog. I thank-you for your passion and willingness to share. Wow, thank you! So nice to receive heartfelt comments like this. Love hearing your story. Have been thinking of starting my own blog to accompany a business venture of my own as well as my attempts to teach myself to quilt. Looking forward to reading more. Thank you for sharing! I think every business should have a blog–it’s the easiest way to communicate and connect with your customers! Good luck!